Warning: There are spoilers ahead for Sunday's episode of "The Walking Dead." Andrew Lincoln's final episode of "The Walking Dead" left Rick Grimes' story open-ended when the beloved sheriff flew off in a helicopter with Anne. If you're worried about if we'll ever see Rick again, AMC was quick to assure fans that Lincoln will be back in some capacity as Grimes. We just may not see him on "TWD" show. 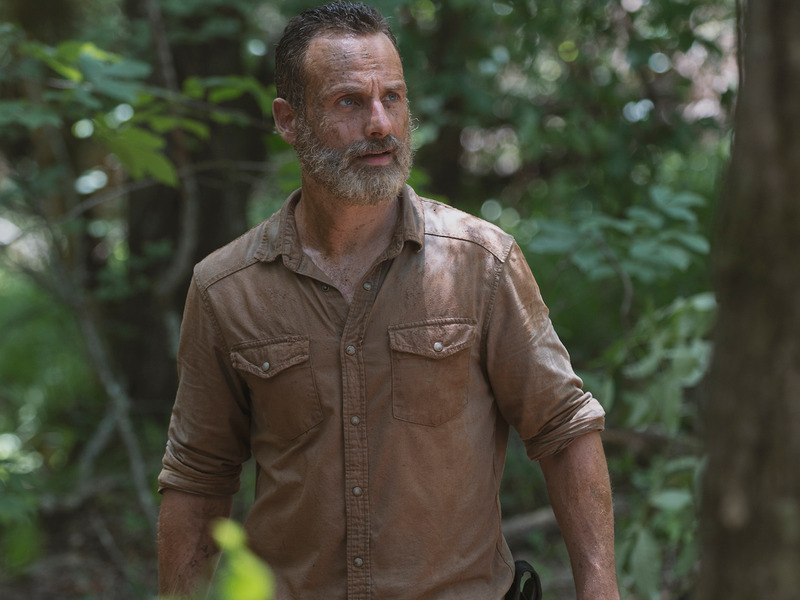 "This is the end of Rick Grimes on 'The Walking Dead,' but this is not the end of Rick Grimes' story," said chief content officer of AMC's "Walking Dead" universe, Scott M. Gimple, on "Talking Dead. "We're going to continue telling Rick Grimes' story in a series of AMC original films. There's a lot of story to tell." Gimple added that these will be AMC original films, which will expand the "Walking Dead" universe as we know it. In September, Bloomberg reported the network has been planning multiple movies and shows based on the zombie universe. "It’s going to show a different corner of the world. It’s going to show a different situation that Rick is involved in. These are going to be shown on AMC, right now, but they are going to have the scope of featured films." Gimple added. "And we’re going to be seeing an epic story told over years." Gimple said a big focus is on telling the continuation of Grimes' story, but those won't be the only "Walking Dead" projects AMC will work on. "We are going to be telling new series in different lengths — shorter series, longer series — we're going to be doing specials. We're working on that now. We're working on digital content. We're working on things that are not easy to describe at the moment," he added. "You're to see characters that are dead and gone. We're going to see stories of their past. We're going to see different stories of future characters. We're just going to be telling 'Walking Dead' stories in different ways. We're going to see all around the world. We're going to see the past, we're going to see the present, might see the future." Gimple added that this is a long-term plan. It won't all come at once. And while some of the new content will be connected to the main "Walking Dead" universe, other content will stand alone. Expect to find out where Rick's mystery helicopter went to next year. According to a press release from AMC, the continuation of Grimes' story will be written by Gimple and the first film will begin production in 2019.